1953 Simplicity #4514 vintage sewing pattern, misses' jiffy wrap-around dress, wrap-around apron and wrap-around skirt, plus size 42. V. 1 features wrap-around dress. 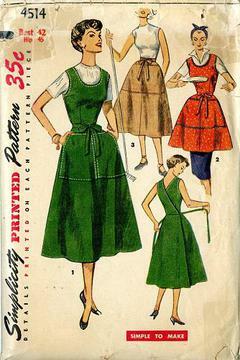 Large patch pockets of gored skirt join at center front and are open at sides. Tie ends sew to back waistline opening edges and tie in a bow at center front. Sleeveless bodice has scoop neckline. Apron has rick rack trim. Skirt, has waistband and pockets.